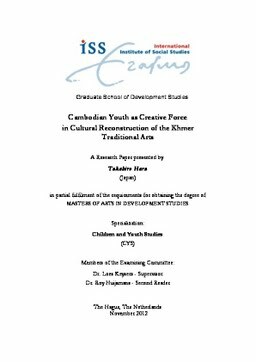 Based on the case study at educational institutions and international NGO in Cambodia, the research aims at understanding how Cambodian youth function in the process of cultural reconstruction in the Khmer traditional arts. Especially, due to the cultural destruction by the Pol Pot regime and globalization in recent years, the Khmer traditional culture is vanishing, and in a state of crisis for the Cambodian government, in terms of building national identity. In these circumstances, various stakeholders entrust Cambodian youth with the task to preserve the culture. By focusing on youth of the age 16–31, the study attempts to understand the complex circumstance in which Cambodian youths are involved, and how Cambodian youths perceive and experience their engagement in the process of cultural reconstruction in the Khmer traditional arts. What was observed in the fieldwork was that Cambodian youths demonstrate their creativity to negotiate their positions toward the Khmer traditional arts, within or outside a spectrum between preserver and creator, under the dynamic day-to-day culture. In these continuous processes, they exercise their agency, and take part in cultural reconstruction of the Khmer performing arts.